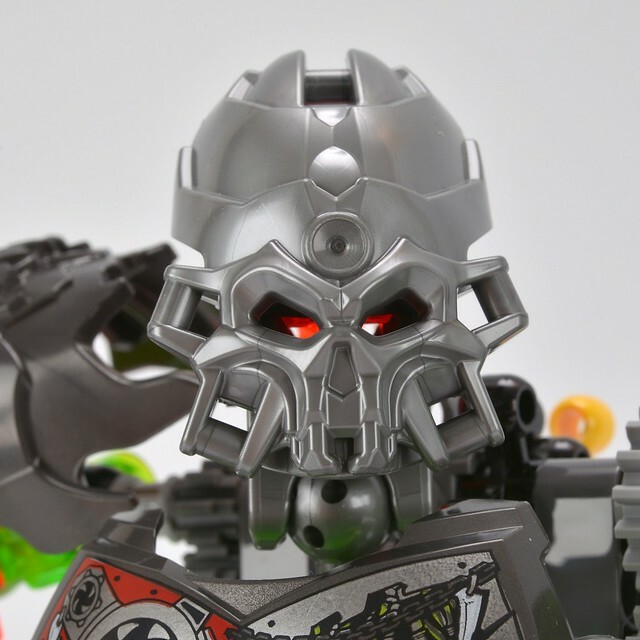 The most successful LEGO in-house IP, Bionicle, was rebooted this year after a five year hiatus. In January new Toa and Protectors, the good guys, were released, followed a couple of months ago by a range of antagonists, who are under the spell of the evil Lord of Skull Spiders. Norton & Co has kindly sent me the summer sets to review. I will start off with 70792 Skull Slicer and 70794 Skull Scorpio. "Patrol the ruins of the ancient arena with the menacing Skull Slicer! This ancient champion has been animated by the dark magic of the Skull Spider Mask, fusing him with his razor-sharp hook blades." 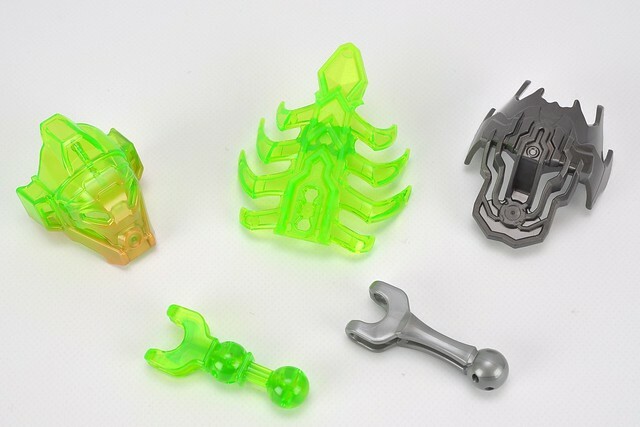 I have been buying Bionicle sets, usually just one or two of each series, since 2001 and one thing that fascinates me is the evolution of their design and the new parts that are introduced each year. 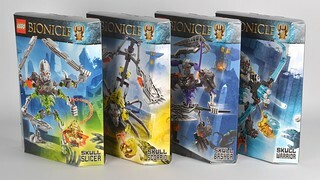 This year's Bionicle sets were the first to be made using the new Character and Creature Building System (CCBS) so everything about the January releases was different to those produced in the 2000s. For the summer sets a number of new CCBS parts have been produced or made in new colours, as shown in the picture below. The most significant, from a CCBS point of view, is the silver 'limb extender' at the bottom. You can see the full inventory of its 71 parts here. Here's the Skull Slicer, who stands about 18cm head-to-toe. He's equipped with 4 arms, 3 wielding skull-slicing swords, the other a mask grabber attached by a very cool florescent orange chain, unique to this set. I'm not keen on his asymmetry, I would have liked 'shoulder pads' for both upper arms. I don't care much for the chest plate either if I'm honest, it looks a little out of place and covers up the more impressive rib cage piece beneath it. 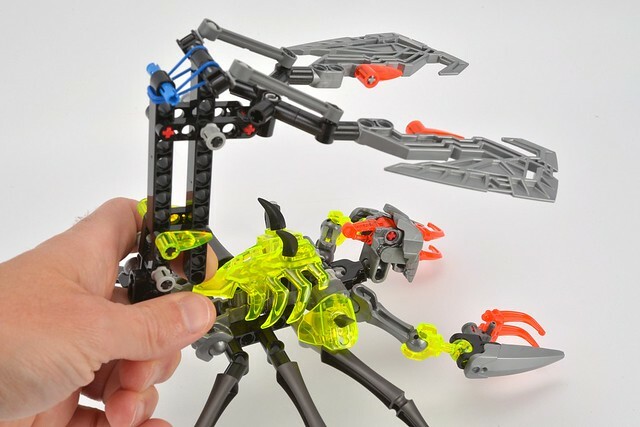 There's quite a complex (for Bionicle) mechanism at the back which enables all four arms to be moved by twisting the yellow gear. A blue friction pin in the gear assembly enables poses to held. He wears a silver Skull Spider mask because he's under the influence of the Lord of Skull Spiders. 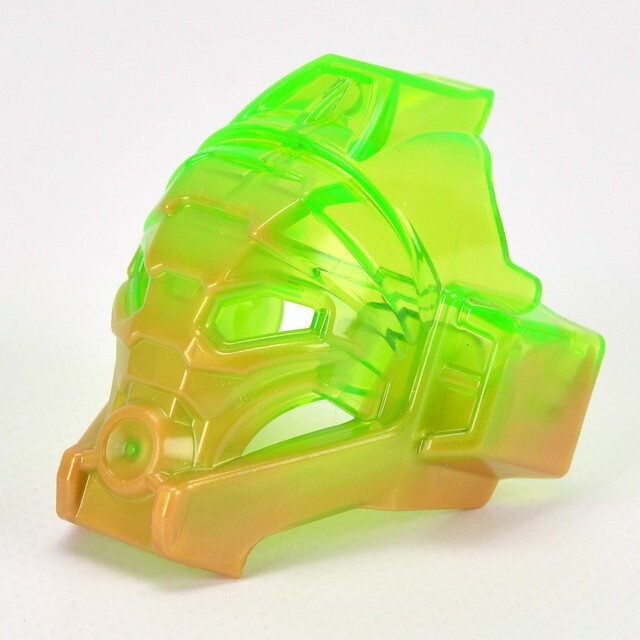 The set contains Lewa's Golden Jungle Mask, being drained of its power, depicted by casting it in gold and florescent green which looks very cool. "This evil creation of Skull Grinder is a fierce enemy for anyone who gets in its way." Unlike the other villains Skull Scorpio is a 6-legged insect-like creature armed with fierce pincers and a sting in its tail. Its legs, Leg 8M With Cross Axle/Ø3.2 Shaft have, until now, only been available in trans light blue. Construction of the body and legs is straightforward. Many of the 107 parts go into making the tail appendage mechanism that, when operated, lunges the blades forward towards any unsuspecting Toa that happen to be in the way. It's a fearsome looking beast! 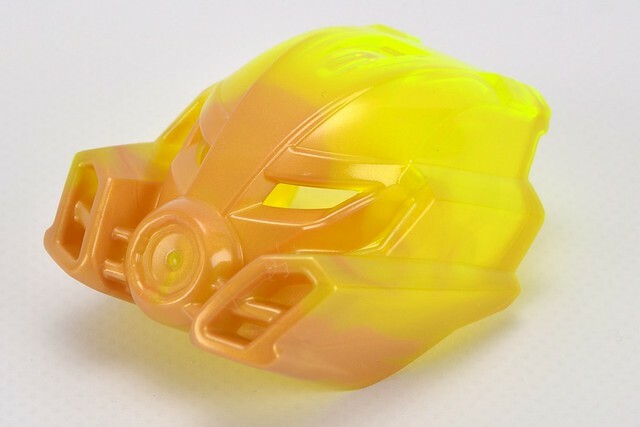 The set contains Pohatu's Golden Mask of Stone, being drained of its elemental power. I enjoyed building these mainly from a 'Bionicle evolution' point of view. The completed models look suitably fearsome and kids will have great fun battling them against the Toas. 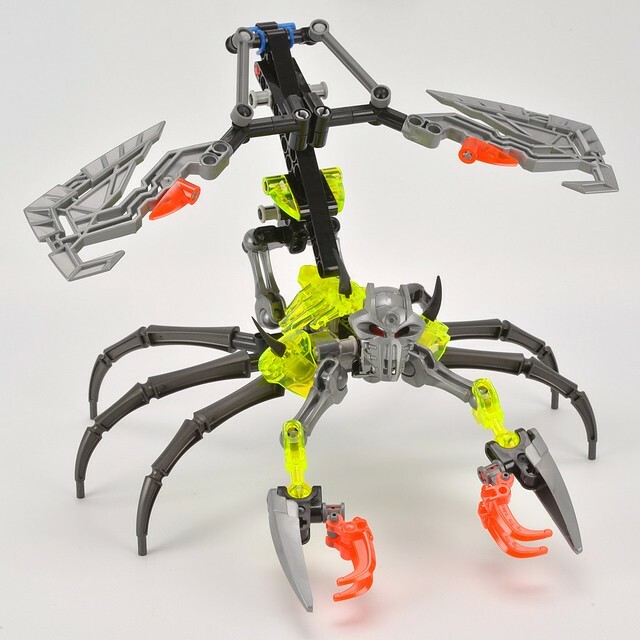 If you're not a Bionicle fan already they are unlikely to convert you to one but I suspect if you build one for yourself you will have fun doing so and may also gain an appreciation of the CCBS system. Thanks to Brickipedia for providing some of the background information. These two aren't under the Lord of the Skull Spiders's control. They are under Kulta, the Skull Grinder's. Scorpio is a creation of Kulta, and Slicer was under his control eventually as well, even though he isn't one of Kulta's creations. Explaining Scorpio: Kulta created two of these to roam the graveyard of the Ancient City to ensure that if the Toa got past the Lord, Warriors and Slicer, they'd have to battle these before resurrecting Ekimu, the Mask Maker. Therefore, they are under Kulta's control, not LoSS's. Explaining Slicer: Slicer was one of the most honoured beings on all Okoto, loved by all it's inhabitants. One day, a Skull Spider attached itself to his face, and he fell under the control of the Lord. Slicer came back, but he was lost to darkness, as the Spider had controlled him for too long. 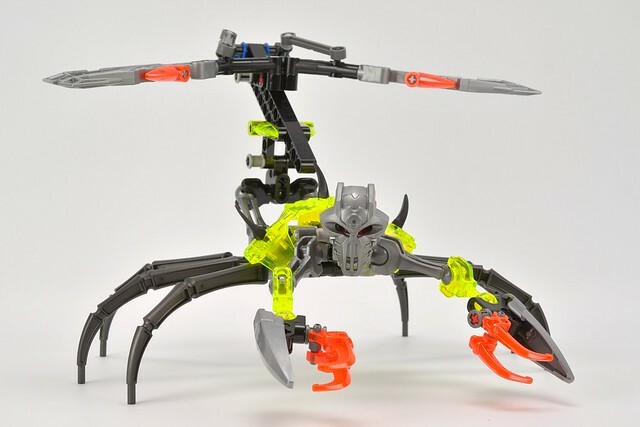 Somehow Slicer started being controlled by Kulta as well, probably because Kulta controlled the Lord, and when the Toa defeated him (before they defeated the other Villains), whatever he was controlling started being controlled directly by Kulta. I own both of the sets, and while Slicer is too small and the arms clash together, I'm OK with the Scorpio. Almost everyone hates him, but I quite like him, after a few very minor modifications are in place. Well, unfortunately the general public didn't see this as much of a sucess, because the January sets are already retiring. @ LegoPegasister2015: They're actually doing well, my local Sainsbury's is often low on them, but IDK about the US. The sets are retiring because the new versions of the Toa are coming out next year, and their companions are Creatures, not Protectors. It makes sense, as these will be sold in the US any time from the beginning of December, I should think. Thanks for the review. I've been having a lot of fun with these new Bionicle sets, quite a step up in my opinion from old-Bionicle or Hero Factory. I'm liking the inclusion of the JangBRICKS reviews at the bottom, it provides a nice visual version of your written reviews, as you say pretty much everything he says! Also, great review Huw! Those drained masks are so cool! The 2 plastics merged together really make it look great! Good review! These are probably my least favorite of the five summer sets, to be honest, but they're still quite creative! They also have some excellent parts and great functions. Skull Scorpio's function is especially good at ripping off other characters' masks. The new weapon elements are really well-designed for that purpose. The color schemes of these sets are also really novel and exciting. The transparent fluorescent reddish orange accents really "pop"! I really like Slicer, he'd be perfect with a bit more trans green armor. Scorpio still looks... blah. These are my favorite two villains, I wonder if they'll add a Nidhiki-like character in the future.